We are a leading Service Provider of customs clearance service from Delhi, India. We are counted as one of the leading service providers of Customs Clearance Service at cost effective prices. 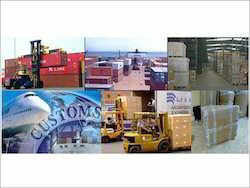 High effectiveness and timely execution makes these customs clearance services highly demanded in the market. In accordance to the specifications provided by the clients, the offered customs clearance services can be custom designed. We also provide logistics services for all 1ypes of import/export air cargo for projects on Pan India basis. Due to extensive & in-depth knowledge of subject and a highly trained manpower, we have successfully executed many projects under Project Import category for our clients engaged in Power Generation projects, Manufacturing, Oil Gas Industry. Looking for Customs Clearance Service ?